Cross Country Triumph at Shrewsbury! 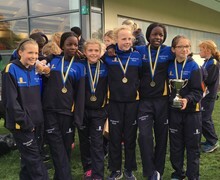 We are very proud of our Cross Country squads who, once again, performed excellently at Shrewsbury Prep Schools’ Cross Country Championship last weekend. The U11 and U13 girls’ teams both won (for the 5th year in a row), with Leo Parr and Flora Crawford winning both their respective races and Sophia Stroud coming in third. There was success for the boys’ teams as well with the U11 and the U13 teams coming second. Congratulations to everyone who took part and to Mr Schofield for his rigorous training regime….which is clearly paying off!